A Cancer and Capricorn love compatibility is full of compromise and balance. These signs have many opposite, but equal traits. These differences between these signs can either bring them together in a harmonious relationship with few ups and downs, or their differences can cause arguments and maybe even a break up if they are not dealt with properly. So long as the Cancer and Capricorn soulmates can learn to work together and listen to each other’s thoughts and attend to their feelings and needs, this relationship should be able to work out, as it is usually based on a foundation of mutual trust and respect. The Cancer zodiac tends to be an emotional sign. However, they are not always the most confident about sharing their thoughts and feelings. Their romantic partner, Capricorn in this instance, will need to be able to gain the crab’s trust if they want to be able to help their partner with their many mood swings. The Cancer man or woman is loyal to their partner, and as long as their partner is loyal to them, they will never cheat on each other. This kind of trust in a relationship is what they are looking for. They usually want a relationship filled with commitment and other traditional values. If their partner does not share their values, then things might not work out very well in the Cancer Capricorn relationship. If someone has feelings for a Cancer, then they better make the first move. While Cancer loves making friends and socializing, they are often slow to make the first move. Once someone else starts the conversation, the crab will be quick to pick up on it and they will be able to warm up to whoever they are socializing with. The Capricorn zodiac is an independent sign, and they like to do things alone, on their own time, or without other people’s influence. This may also be why they like to deal with their thoughts and feelings on their own, the opposite of Cancer. At times, the Sea goat may feel uncomfortable with how much Cancer wants to talk about their feelings. To them, talking about your feelings it like a strange and new practice that they are unsure about trying. It might take a lot of coaxing to get the Capricorn into talking about their feelings, it could take a while to actually work. Capricorn is a caring partner though. They will do what they can to make their partner feel better when they are done. They also like to hang out with their friends on their free time. Overall, this is a sign that knows what they like to do, and what they don’t like to do. They won’t change for anyone, but they may try to adjust for someone if they really care about them. And this is what is needed for the Cancer and Capricorn compatibility to work. Although in a Cancer Capricorn relationship, these signs may seem like opposites in many regards, they can still make a great couple. Let’s look at some of the pros of a Cancer Capricorn compatibility. Capricorn likes to do a lot of things alone, and this can cause them to become stressed out. Cancer is there to provide balance and peace in a Sea Goat’s busy life. They love that their partner does so much to help out and make his or her life all the easier because of it. Cancer is also great at making a house feel like a home. They love their home to feel welcoming and natural. They usually have traditional values, and this means in part that they will often want children to fill their homes with. Many people in today’s world have stressful jobs that they find no pleasure in, so Capricorn loves to be able to come home to a peaceful environment put in place by their partner. They are much more likely to spend more time at home with their children if their house is a peaceful place to be. If you are a Cancer married to a Capricorn, don’t worry. They do put some effort into home values. Capricorn loves to have a good time, but they also want their life to be stable as well. They are hard workers who will succeed in their job well enough so that they can support their family. It is likely that they will be able to successfully sustain their family’s finances without their partner needing to get a job as well. This will help to make the Capricorn-Cancer love compatibility all the more stable and enjoyable. When a Cancer is dating a Capricorn, they don’t need to worry about losing friends because of their relationship like some other Cancer or Capricorn pairings. These two love spending time with each other’s family and friends. They have no problem with going on double dates or to family reunions as the Cancer and Capricorn compatibility is excellent. Capricorn is able to realize how important family is to Cancer, so they will put forth their best effort when it comes to interaction and making a good impression on their family. This is just one of the many things that the goat is able to notice about the crab. As the longer they are together, the deeper connection they have. Little facts about Cancer will stick in Capricorn’s head, and they will make sure to surprise them with what they remember every now and again in this Cancer Capricorn friendship. (Take this friendship test). Although the Cancer Capricorn in love are highly understanding of each other’s thoughts and feelings most of the time, sometimes these two signs tend to slip up, argue, and just have bad days in general. 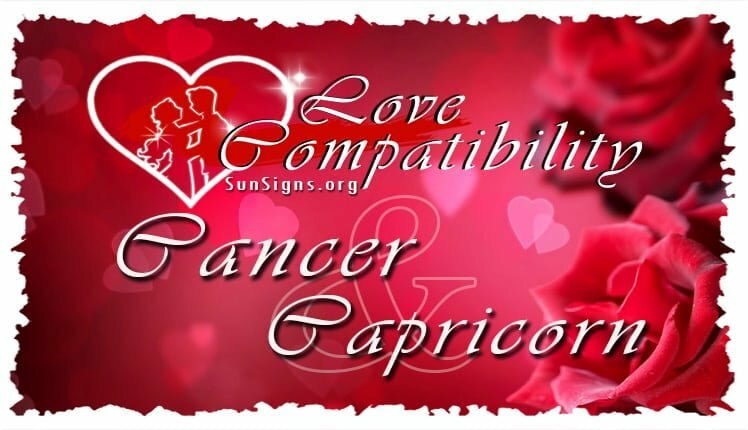 Let’s look at a few cons of the Cancer Capricorn love compatibility. While Cancer loves to make their house feel warm and welcoming, it takes a lot of effort to do that, especially if they have children who like to make a mess. Capricorn may not notice the effort that their mate puts into keeping the house clean or making the meals delicious, as they are likely to put most of their effort into a job. It is likely that a Capricorn will not want to help out once they get home from work; they will just want to relax. This can stress out Cancer and make him or her upset at their partner for not helping out more around the house. This could very well lead to an argument between the two signs. The Capricorn personality also looks at the world too seriously at times, making the relationship less fun than it could be. They are more focused on what the future could be, rather than improving their present situation, which is likely to make the emotional Cancer upset. They often get preoccupied with things that the crab might not see as important. The goat is the type of person to put in long hours at work or studying for school, only to come home to work on a hobby alone or do more work or school work. The Cancerian will find this annoying thus destroying the Cancer Capricorn compatibility. Sometimes Cancer will get lonely while they are home alone, and this the time when most crab people get their worst mood swings. They will feel poorly that their lover is not there to help them. Although Cancer is a dependable sign, they are also dependent once they get too close to someone. When Cancer is upset they will have a harder time communicating with their partner about what they want in a relationship. This can make matters all the more complicated and stressful sexually for the Cancer and Capricorn in bed. Each member of this relationship will need to make sacrifices in order to keep the other happy, which in turn can make themselves unhappy. The Cancer Capricorn love compatibility will need compromise and lot of work if this match is not to end in a break up. (Read about Capricorn Sexual Traits). In conclusion, the Cancer and Capricorn love compatibility can have their good days and their bad days, but in reality they need to put a lot of effort to make their relationship work. This is an average pairing, but there are other zodiac signs that these both could be with and have a better and easier relationship with.